Mr. and Mrs. Reyes are puzzled as to why their 2-month old baby would not stop crying. They fed him already, his diapers are newly changed, the temperature is just right, and the environment is calm. But the baby continues his high-pitched, urgent crying. Worried, they rushed him to the emergency department, where all diagnostic tests and physical assessment are deemed normal. “It seems your baby has colic”, the pediatrician announced after making sure that everything is normal. During episodes of colic, an otherwise healthy neonate or infant aged 2 weeks to 4 months is difficult to console. Colic is most likely to occur in the evenings, and it occurs without any identifiable cause. The most widely used definition of colic was used by Wessel et al; their definition is based on the amount of crying (ie, paroxysms of crying lasting >3 hours, occurring >3 days in any week for 3 weeks). 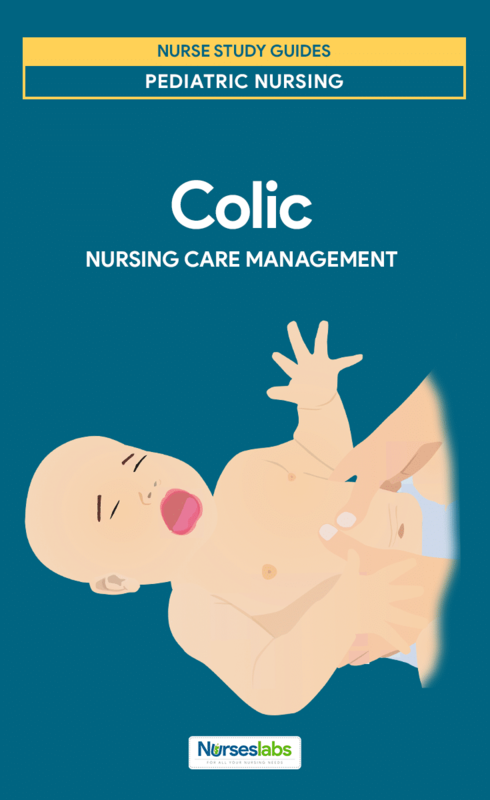 Colic is a poorly understood phenomenon; it is equally likely to occur in both breastfed and formula-fed infants. The term colic derives from the Greek word kolikos or kolon, suggesting that some disturbance is occurring in the GI tract. Researchers have also postulated nervous system, behavioral, and psychologic etiologies. A meta-analysis indicated that colic may be a form of a migraine headache rather than, as has been proposed, a GI condition. The analysis utilized 3 studies (891 subjects total), one of which indicated that there is a greater likelihood of colic in infants whose mothers have migraine headaches and the other two of which indicated that infants with colic are more likely to experience a migraine in childhood and adolescence. Using a pooled random-effects model in their analysis, Gelfand and colleagues found the odds ratio for an association between a migraine and colic to be 5.6. In a secondary analysis, which included two additional studies (both of which also looked at the colic/migraine link but addressed a different primary research question), the odds ratio for the association between a migraine and colic was 3.2. 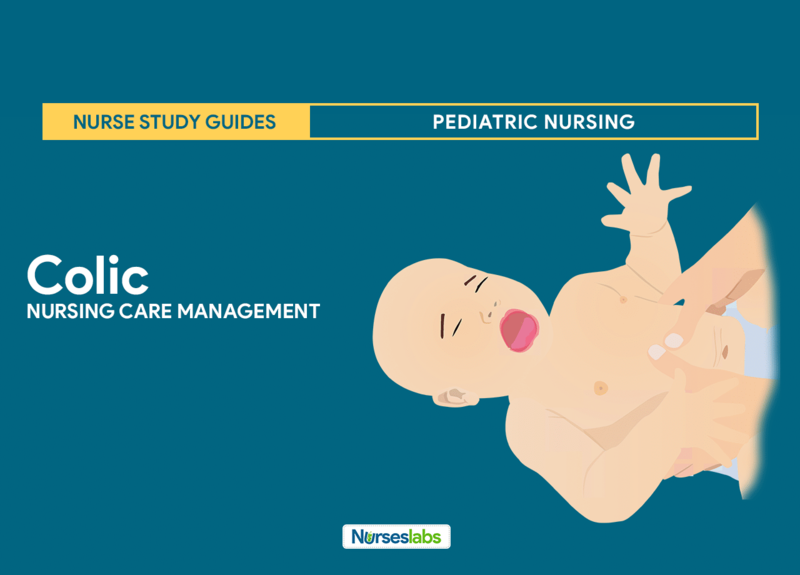 Colic is one of the common reasons parents seek the advice of a pediatrician or family practitioner during their child’s first 3 months of life. 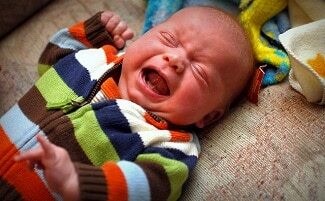 Colic affects 10-30% of infants worldwide. Increased susceptibility to recurrent abdominal pain, allergic disorders, and certain psychological disorders may be seen in some babies with colic in their childhood. This condition is encountered in male and female infants with equal frequency. The colic syndrome is commonly observed in neonates and infants aged 2 weeks to 4 months. GI causes. GI causes may include but are not limited to gastroesophageal reflux, overfeeding, underfeeding, milk protein allergy, and early introduction of solids. Inexperienced parents (controversial) or incomplete or no burping after feeding. Incorrect positioning after feeding may contribute to excessive crying; note that colic is not limited to the first-born child, casting doubt on the theory about inexperienced parenting as the etiologic factor. Exposure to cigarette smoke and its metabolites. Some epidemiologic evidence suggests that exposure to cigarette smoke and its metabolites may be related to colic; maternal smoking and exposure to nicotine replacement therapy (NRT) during pregnancy may be associated with colic. Food allergy. Some evidence has linked persistent crying in young infants to food allergy; an association between colic and cow’s milk allergy (CMA) has been postulated. Low birth weight. Data from one study suggested an association between low birth weight and an increased incidence of colic. Characteristic intestinal microflora. Some reports have focused on intestinal microflora and its association with colic; lower counts of intestinal lactobacilli were observed in infants with colic compared with infants without colic. Normal physical findings. Infants with colic appear normal upon physical examination. Weight gain. Infants with colic often have accelerated growth; failure to thrive should make one suspicious about the diagnosis of colic. Exclusion of potentially serious diagnoses that may be causing the crying. On acoustic analysis, colicky crying differs from regular crying; compared with regular crying, colicky crying is more variable in pitch, more turbulent or dysphonic, and has a higher pitch; mothers of infants with colic, unlike mothers of infants without colic, rate the cries as more urgent, discomforting, arousing, aversive, and irritating than usual. Laboratory studies are usually not indicated in colic unless the physician suspects another condition, such as gastroesophageal reflux. Clinitest. If the patient’s stools are excessively watery, testing them for excess reducing substances (Clinitest) may be worthwhile; if results are positive, this may be an indication of an underlying GI problem, such as acquired (postinfectious) lactose intolerance. Stool exam. Stool may be tested for occult blood to rule out cow’s milk allergy (CMA). Rule out common causes of crying is the first step in treating an infant with persistent crying. Allow others to care for the infant. Recommend that the parents not exhaust themselves and encourage them to consider leaving their baby with other caretakers for short respites. Follow-up. Consistent follow-up and a sympathetic physician are the cornerstones of management. Anticholinergic. Dicyclomine hydrochloride is an anticholinergic drug that has been proven in clinical trials to be effective in the treatment of colic; however, because of serious, although rare, adverse effects (eg, apnea, breathing difficulty, seizures, syncope), its use cannot be recommended. Diet. Maternal low-allergens diets (ie, low in dairy, soy, egg, peanut, wheat, shellfish) may offer relief from excessive crying in some infants. Medications for colic are until under consideration and research. Simethicone. Simethicone is a nonabsorbable medication that changes the surface tension of gas bubbles, allowing them to coalesce and disperse and releasing the gas for easier expulsion. Herbal remedies. Herbal remedies have been used in many cultures; the common ingredients include chamomilla, bitter apple, and fenugreek; only a handful of studies of herbal products have been conducted, and additional studies of their safety and efficacy are needed. History. Obtain a detailed history about the timing, the amount of crying, and the family’s daily routine; the benign nature of colic should be emphasized; rule out causes of excessive crying in an infant, such as having hair in the eye, strangulated hernia, otitis, and sepsis. Physical exam. Perform a physical examination to confirm normalcy; infants with colic often have accelerated growth; weight gain is typical, whereas failure to thrive should make one suspicious about the diagnosis of colic. Acute pain related to abdominal distention and tenderness. Deficient knowledge related to lack of exposure and unfamiliarity with information resources. Impaired parenting related to lack of knowledge and confidence in parenting skills. Caregiver/s describe/s satisfactory pain control at a level less than 3 to 4 on a rating scale of 0 to 10. Caregiver/s report improved well-being such as baseline levels for pulse, BP, respirations, and relaxed muscle tone or body posture. Caregiver/s explains disease state, recognizes the need for medications and understands treatments. Caregiver/s report improved confidence in parenting and caring for the infant. Reduce/relieve pain. Assess pain characteristics; acknowledge reports of pain immediately; provide rest periods to promote relief, sleep, and relaxation; place infant on a position of comfort to reduce pain. Educate caregivers on the disease. Assess ability to learn or perform desired health-related care; determine priority of learning needs within the overall care plan; observe and note existing misconceptions regarding material to be taught; grant a calm and peaceful environment without interruption; include the caregivers in creating the teaching plan, beginning with establishing objectives and goals for learning at the beginning of the session; provide clear, thorough, and understandable explanations and demonstrations; allow repetition of the information or skill. Improve parenting skills. Interview parents, noting their perception of situational and individual concerns; educate parents regarding child growth and development, addressing parental perceptions; involve parents in activities with the infant that they can accomplish successfully; recognize and provide positive feedback for nurturing and protective parenting behaviors. Caregiver/s described satisfactory pain control at a level less than 3 to 4 on a rating scale of 0 to 10 (face scale). Caregiver/s reported improved well-being such as baseline levels for pulse, BP, respirations, and relaxed muscle tone or body posture. Caregiver/s explained disease state, recognizes the need for medications and understands treatments. Caregiver/s reported improved confidence in parenting and caring for the infant. Option C: This is a good sign that the client is ready and confident about caring for the infant. Options A, B, D: These options show little confidence in the caregiver, which decreases bonding. A nurse at the family clinic receives a call from the mother of a 5-month old infant. the mother states that the infant is diagnosed with colic at the last check up. Unfortunately, the symptoms have remained the same. Which instructions are appropriate? Select all that apply. Position the infant on his back after feedings. Soothe the child by humming and rocking. Immediately bring the infant to the emergency department. Burp the infant adequately after feedings. Provide small but frequent feedings to the infants. Offer the pacifier if it is not time for the infant to eat. Options B & F: Rocking, riding in a car, humming, and offering a pacifier may comfort the infant. Options D & E: Decreasing gas formations by frequently burping, giving smaller feedings more frequently, and positioning the infant in an upright seat is also an appropriate teaching. Option A: Normal heart rate of the newborn is 120 to 160 bpm. Options B, C, D: Options A, B, and C are normal assessment findings (uneven head shape is molding). Option D: The Faces pain rating scale (depicting smiling, neutral, frowning, crying, etc.) is appropriate for young children who may have difficulty describing pain or understanding the correlation of pain to numerical or verbal descriptors. Options A, B, C: The other tools require abstract reasoning abilities to make analogies and use of advanced vocabulary. Option A: Noninvasive measures may result in release of endogenous molecular neuropeptides with analgesics properties. They potentiate the effect of analgesics. Option B: No evidence indicates that noninvasive and nonpharmacologic measures are more effective than analgesics in relieving pain. Option C: There is no connection between type C fiber impulses and noninvasive and nonpharmacologic pain-control measures. Option D: Decreased input over large fibers allows more pain impulses to reach the central nervous system. 1. Which of the following behaviors would indicate that a client was bonding with her baby? A. The client feeds the baby every three hours. B. The client asks the nurse to recommend a good childcare manual. C. The client talks to the baby and picks him up when he cries. D. The client asks her husband to give the baby a bottle of water. 1. Answer: C. The client talks to the baby and picks him up when he cries. Option C: This is a good sign that the client is ready and confident about caring for the infant. Options A, B, D: These options show little confidence in the caregiver, which decreases bonding. 2. A nurse at the family clinic receives a call from the mother of a 5-month old infant. the mother states that the infant is diagnosed with colic at the last check up. Unfortunately, the symptoms have remained the same. Which instructions are appropriate? Select all that apply. A. Position the infant on his back after feedings. B. Soothe the child by humming and rocking. C. Immediately bring the infant to the emergency department. D. Burp the infant adequately after feedings. E. Provide small but frequent feedings to the infants. F. Offer the pacifier if it is not time for the infant to eat. 2. Answers: B, D, E, F.
Options B & F: Rocking, riding in a car, humming, and offering a pacifier may comfort the infant. Options D & E: Decreasing gas formations by frequently burping, giving smaller feedings more frequently, and positioning the infant in an upright seat is also an appropriate teaching. 3. The nurse is assessing a newborn who had undergone vaginal delivery. Which of the following findings is least likely to be observed in a normal newborn? 3. Answer: A. Heart rate is 80 bpm. Option A: Normal heart rate of the newborn is 120 to 160 bpm. Options B, C, D: Options A, B, and C are normal assessment findings (uneven head shape is molding). 4. In caring for a young child with pain, which assessment tool is the most useful? 4. Answer: D. Faces pain-rating scale. Option D: The Faces pain rating scale (depicting smiling, neutral, frowning, crying, etc.) is appropriate for young children who may have difficulty describing pain or understanding the correlation of pain to numerical or verbal descriptors. Options A, B, C: The other tools require abstract reasoning abilities to make analogies and use of advanced vocabulary. 5. Which statement represents the best rationale for using noninvasive and non-pharmacologic pain-control measures in conjunction with other measures? A. These measures potentiate the effects of analgesics. B. These measures are more effective than analgesics. C. These measures block transmission of type C fiber impulses. D. These measures decrease input to large fibers. 5. Answer: A. These measures potentiate the effects of analgesics. Option A: Noninvasive measures may result in release of endogenous molecular neuropeptides with analgesics properties. They potentiate the effect of analgesics. Option B: No evidence indicates that noninvasive and nonpharmacologic measures are more effective than analgesics in relieving pain. Option C: There is no connection between type C fiber impulses and noninvasive and nonpharmacologic pain-control measures. Option D: Decreased input over large fibers allows more pain impulses to reach the central nervous system.